Delivery of gold is required by 4pm. Cash for trades is required by 5pm. In order to trade, a PMM member is required to submit two types of collateral, analogous to initial margin and variation margin. The final settlement price is the afternoon LBMA Gold Price (published by ICE Benchmark Administration after the 3pm London auction). The LBMA Gold Price is converted to a TRY/Gram price and deemed the final settlement price. Calculations for USD/TRY conversation use the USD/TRY ask rate announced by the Turkish Central Bank at 3:30pm. Ounce/gram conversion uses 31.1035. If the afternoon LBMA Gold Price has not been released, the morning LBMA Gold Price is used instead. The gold market in Turkey centres around organised gold trading venues that are part of Turkey’s multi-market financial exchange venue, Borsa Istanbul. Physical spot gold trading takes place on Borsa Istanbul’s Precious Metals Market (PMM), and gold futures trading takes place on the Borsa’s Precious Metal Futures Market (PMFM). The Turkish gold market was initially liberalised in 1993 following legislative changes which commenced in 1989. Prior to liberalisation, only the Central Bank of the Republic of Turkey (Türkiye Cumhuriyet Merkez Bankasi) was authorised to import gold into the country. One of the main thrusts of the gold market liberalisation was to free up international gold trade flow by allowing entities other than the central bank to begin importing gold. The precursor to the PMM, the Istanbul Gold Exchange, opened in July 1995, offering spot and futures trading in gold. Silver and platinum trading were added in 1999, and palladium trading began in 2011. From 1995, Istanbul Gold Exchange members were authorised by the Government to import gold into Turkey. In April 2013, the Istanbul Gold Exchange, the Istanbul Stock Exchange, and the Turkish Futures and Options Exchange (VOB) completed a three-way merger to become Borsa Istanbul AS (BIST). Following the merger, gold import authorisation subsequently applied to members of the PMM on the Borsa Istanbul. One of the stipulations for PMM members importing gold into Turkey is that the imported gold has to be transferred to the Borsa Istanbul vault within 3 days of arrival in Turkey. There are 96 members on the Precious Metals Market (PMM), including 23 banks (domestic and foreign), 41 authorised corporations (previously known as currency offices), 19 brokerage houses, and 12 metal producers / marketing companies. International bank members of the PMM, which in practice are Turkish branches of international banks, include ING, HSBC, and Finansbank (owned by National Bank of Greece). Domestic bank members include state-owned Ziraat Bankasi, and privately owned Turkiye Is Bankasi, Garanti, and Akbank. Borsa Istanbul also hosts a ‘Diamond and Precious Stone Market’, and 57 of the diamond market members are also members of the Precious Metals Market. Bursa Istanbul is also an Affiliate of the London Bullion Market Association (LBMA). The Precious Metals Market conducts spot trading of gold (‘altin’ in Turkish), silver, platinum and palladium on an electronic platform in both ‘standard‘ and ‘non-standard’ quality metals. Gold is traded in three trading units, Turkish Lira per kilogram (TRY/kg), US Dollar per ounce (USD/oz), and Euro per ounce (EUR/oz). Trading volumes are highest in the USD/oz contract, followed by the TRY/kg contract. Volumes on the EUR/oz contract are very low. The TRY/kg contract has a settlement cycle of Trade Date + 2 max. The USD/oz contract has settlement dates out to Trade date + 15 days (T+15). There are no taxes on gold traded on the PMM. Buy and sell orders for the Precious Metals Market are input by member representatives into the Market’s electronic trading system and automatically matched. Matched orders are then executed. Outstanding orders continue to be displayed in the system’s market data feed. To clear spot gold trades on the PMM, the buyer transfers the required funds to a custody bank, and Borsa Istanbul transfers gold from the seller’s account in the Exchange’s vault to the buyer’s account in the Exchange vault. This may necessitate a seller delivering gold to the Exchange vault if the seller does not have the required gold already in situ.. The PMM accepts both Standard and Non-Standard gold. Standard gold is unprocessed gold bullion, in the form of bars of minimum 995/1000 fineness. ‘Bullion’ bars and other bars require a refinery stamp, serial number, weight and fineness. These criteria apply to both internationally accredited and domestic refineries. Non-standard gold is unprocessed gold in the form of gold bullion, gold bars, dore bars, granules, powder or scrap below 995/1000 fineness. Domestic non-standard gold requires an assay certificate (of fineness) from the Turkish Mint or assaying institutions approved by the Turkish Mint. Imported non-standard gold requires a similar assay certificate from an international refinery, as well as a Turkish customs declaration. The PMM draws on the accreditation lists of a number of international gold associations and other gold exchanges in determining eligibility of bar brands on its international refiner list. This includes consideration of gold refineries accredited by the London Bullion Market Association, the Dubai Multi Commodity Centre, and the Indian Bullion Market Association. Qualifying domestic refineries are also then added to the PMM’s accredited refinery list. Gold lending and the trading of lent gold is conducted on Borsa Istanbul’s Precious Metal Lending Market. This lending market was established in March 2000. Initially, physical gold is lent, against which loan certificates are issued. Following this, the loan certificates can then also be traded. Orders into the lending market are matched by maturity and lending rate. Loans are in physical gold. Loans can either be cash-settled or settled by physical delivery of gold (this will be specified in the original orders). Borrowers are required to put up collateral to the Exchange in the form of cash or precious metals, and can borrow up to 90% of the collateral. A typical borrower would be a Turkish jewellery company or a Turkish gold product manufacturer. Membership of the precious metals lending market comprises 13 members, 11 of which are banks and the remaining 2 of which are producers/marketing companies. HSBC’s Turkish branch is the only international bank member of the lending market. Trading hours for the lending market are on business days between 9:45am and 5:30pm (for lending transactions and trading of certificates). All gold transacted by members on the PMM and lending market must be stored at the Borsa Istanbul vault. Members also store other gold at this vault, as do gold backed product providers of products traded on the Exchange such as investment funds and gold exchange trade funds (ETFs). According to Borsa Istanbul “precious metals that are subject to transactions under investment funds and investment partnerships must be stored in the vault of Borsa Istanbul“. Bank members of the PMM that hold gold to meet the reserve requirements of the Turkish Central Bank can also store this gold in custody at the Borsa Istanbul vault in the custody account of “Required Reserves of the Turkish Central Bank“. See below for discussion of gold as a component of Turkish commercial banks’ required reserves. Borsa Istanbul publishes various data bulletins covering the Precious Metals Market such as a monthly bulletin and a weekly bulletin. There are two cash-settled gold futures contracts traded on the Borsa Istanbul futures market, Turkish Lira per gram gold futures and US Dollars per ounce gold futures. The Borsa’s TRY gold futures product was inherited from the Turkish Derivatives Exchange (VOB) when Borsa was formed from the three-way merger of the Istanbul Gold Exchange, Istanbul Stock Exchange, and VOB. Historical market data on gold futures is viewable on the Exchanges website, but is produced in runnable queries, so needs to be requested via running date driven data selections[Borsa Istanbul – Derivatives market data http://www.borsaistanbul.com/en/data/data/viop-derivatives-market]. In December 2015, the European Bank for Reconstruction and Development (EBRD) took a 10% stake in Borsa Istanbul. Borsa Istanbul is currently majority owned by the Turkish Government, but the Exchange plans an IPO at some point in the future and the EBRD investment is a precursor to helping to facilitate this floation. Borsa Istanbul’s long-term goal is to become an exchange hub servicing the south-east of Europe, North Africa, and Central Asia. Turkey is the world’s 4th largest gold consuming nation and accounts for 6% of global consumer demand for gold. Turkey is also noted as a high gold ‘hoarding’ nation, and the World Gold Council estimates that Turkish households hold more than 3,500 tonnes of gold. Turkish household gold is highly liquid and has, during economic crises, been recycled and mobilised back into the Turkish economy through resale to jewellers and banks. The Turkish gold jewellery sector is an important part of the Turkish economy, and according to the Ministry of Economy employs 250,000 people and supports 5,000 gold fabricators and 35,000 retail outlets. The gold jewellery sector is extensive and caters for domestic demand and the export market. The centre of the country’s gold jewellery sector is concentrated in two districts in Istanbul, namely Kuyumcukent and the Grand Bazaar. The Kuyumcukent facility also contains a cluster of goldsmiths. Istanbul Gold Refinery (IGR) was founded in 1996 as a joint project between the Istanbul Gold Exchange and the Turkish Treasury, but it only began operations in 2002 when a Turkish jewellery company Halaç Jewellery became involved. The refinery has a production capacity of 2.5 tonnes of gold per day and 2 tonnes of silver per day. IGR produces investment grade casted gold bars in sizes of 100g, 250g, 500g and 1 kilogram, and minted gold bars in denominations of 0.5g through to 100g. IGR operates an international department called IGR Global which has offices in Dubai, Frankfurt and Madrid, which engage in gold trading, sourcing metal from miners and scrap markets, and distribution of the refinery’s products internationally. IGR is accredited on the LBMA’s Good Delivery List for gold, and the Borsa Istanbul’s accredited refinery list. The precursor of Nadir Metal Rafineri was established in 1967. Nadir’s plant refines gold from mine and scrap sources, and produces large Good Delivery gold bars (400oz), kilo bars, and smaller bars from 500g down to 0.5g. Nadir has affiliate offices in Dubai and in Vicenza, Italy engaged in marketing and distribution, and the Istanbul refinery is accredited on the LBMA’s Good Delivery List for gold, and the Borsa Istanbul’s accredited refinery list. Nadir has an affiliate in the Turkish market called Nadir Doviz, which acts as a wholesaler and distributor for Nadir products, and is one of the most active members of the Borsa Istanbul’s Precious Metals Market. Atasay is a well-known Turkish jewellery company which also operates a precious metals refinery in Istanbul. Atasay mainly refines scrap gold from the Turkish jewellery sector, but also refines some gold from mining sources. The Turkish State Mint, which reports to the Turkish Treasury and is responsible for production of Turkish currency and coinage, also manufactures ‘Republican’ gold coins of two types, namely Meskük, which are plain coins, and Ziynet, which are decorative coins. Turkey is officially called the Republic of Turkey, hence the name ‘Republican’ coins. Turkey has an active and sizeable gold mining industry which produced 30.7 tonnes in 2014 and 33.5 tonnes in 2013. According to the World Gold Council, the Turkish gold mining sector employess over 6,000 people. Eldorado, the Canadian gold miner, has 2 operating mines in Turkey, Kişladağ (Usak province) and Efemçukuru (Izmir province)which produced a combined output of over 10 tonnes of gold in 2015. Koza Gold is a Turkish company which operates 4 gold mines at 3 locations, namely, Ovacik, Çukuralan and Kaymaz. In 2014, it produced nearly 10 tonnes of gold. Alacer Gold, a Canadian mining company, has an 80% share in the operating Çöpler gold mine in the east of Turkey. In 2015, the Çöpler mine produced 6.3 tonnes of gold[fn http://www.alacergold.com/docs/default-source/press-releases/announces-2015-year-end-operating-amp-financial-results.pdf?sfvrsn=6]. In 2011-2012, the Central Bank of the Republic of Turkey (CBRT) altered its rules on reserve requirements for Turkish commercial banks, by allowing commercial banks to use ‘Standard gold’ as part of the reserves that they hold with the CBRT. Reserve requirements refer to the proportion of commercial banks’ customer deposits that the banks need to keep in reserve rather than lend out. These reserves (which are liabilities of the commercial banks to the depositors), are held on deposit with the central bank, and become assets of the central bank and liabilities of the central bank to the commercial banks. The rule changes were designed with a number of aims, including attracting Turkish households to move their gold holdings into the Turkish financial sector, boosting the central bank’s gold reserves, and increasing Turkish commercial bank Turkish Lira liquidity. Prior to 2011-2012, Turkish banks had already been offering their customers precious metals deposit accounts, including gold deposit accounts, as a way of harnessing gold ‘hoarded’ in the economy. Turkey commercial banks could then free-up Turkish Lira by substituting gold, and use this extra Lira liquidity for other purposes such as commercial lending. The reserve requirement changes merely incentivised commercial banks to extend their gold deposit and similar schemes. In September 2011, the CBRT amended its reserve requirement rules to allow Turkish commercial banks to deposit ‘standard gold’ at the central bank in fulfillment of all of the reserve requirements for precious metals deposit accounts (part of the reserve requirements for TRL liabilities), and for 10% of the reserve requirements for foreign currency liabilities excluding precious metal deposit accounts. In March 2012, the central bank raised the ratio from 10% to 20% for ‘standard gold’ reserves that could be held to meet Turkish lira reserve requirements and phased out using ‘standard gold’ reserves to meet foreign currency reserve requirements. The central bank again raised the limit on standard gold to 25% of Turkish Lira requirements in June 2012, and then to 30% in August 2012. Notably, the central bank only held 116 tonnes of gold before it amended the reserve requirement rules in 2011. According to World Gold Council official gold reserve data, the Turkish central bank now reports holdings of over 500 tonnes of gold. The central bank has also confirmed that it has not purchased any gold since the reserve requirement changes. This means that since 2011, Turkish commercial banks have enthusiastically embraced the CBRT required reserves scheme, and now hold nearly 400 tonnes of gold as part of their reserve requirements with the central bank. See BullionStar article “The Turkish Gold Standard, Part 1” for further coverage of the CBRT scheme. Turkish gold import data is published on the Borsa istanbul’s PMM website. Gold import data into Turkey is also published in the Turkish foreign trade statistics database. To retrieve gold import data from this trade statistics database, select ‘Databases’ from the left hand frame, then select ‘foreign trade’ from the databases drop down list, then click on ‘Foreign trade Statistics’. You can then search by ‘Product/Product Group – Partner Country’ and by the Harmonized System using HS8 characters etc. Turkey‘s largest gold import sources are from Switzerland, United Arab Emirates and South Africa, and its largest gold export destinations are United Arab Emirates and Switzerland. 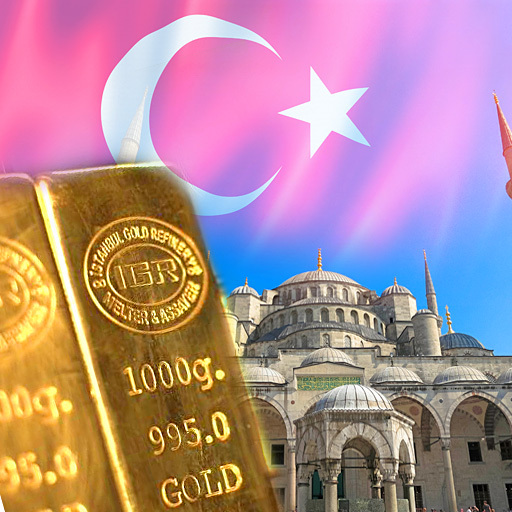 Turkey’s extensive gold market is a key component of Turkey’s overall economy. From mining to refining, through to on-exchange spot and futures trading, and an active gold import and export trade, the Turkish gold market is a model example of a vertically integrated market. Among the Turkish population, physical gold is held and ‘hoarded’ as a store of value and currency hedge, in an economy that has seen more than its fair share of rampant inflation and eroding currency values over the years. This hoarding of gold (and its dis-hoarding in time of need), is not just through bars and coins, which explains why the gold jewellery industry is so important in Turkey and why scrap gold jewellery can be a ready source of material for the Turkish gold refineries. The Turkish gold market is also unique in having harnessed customer gold for use as commercial bank reserves, which has given rise to what, on paper, looks like double counting of ‘the people’s gold’ as part of official central bank gold reserves. As a historic crossroads of trade between Europe and Asia, modern-day Turkey, and particularly Istanbul, continues to fulfill this role. No sector demonstrates this more than the gold market. From raw gold imports from mining sources and refined gold imports from Switzerland on the one side, through to gold jewellery and bar exports to Dubai and India on the other, the Turkish gold market lends itself to the role of middleman, albeit sometimes in a less than transparent fashion, as recent controversial Turkey to Dubai gold exports highlight.